Left: Nasty Gal, Bottom Right: Dolls Kill, Top Right: Dolls Kill. Not to be confused with wedge sneakers, creepers are thick, flat platform shoes with crepe soles. A few years ago, this was a massive fashion trend. It has died down a bit since then, but there are now fashion designers and influencers who are bringing creepers back! Creepers are a great way to step out of your comfort zone if you’ve never worn platform shoes before. They’re stylish, trendy, and they make your outfit stand out. Plus, they’re coming back around, so you’ll be ahead of the times if you wear them now. 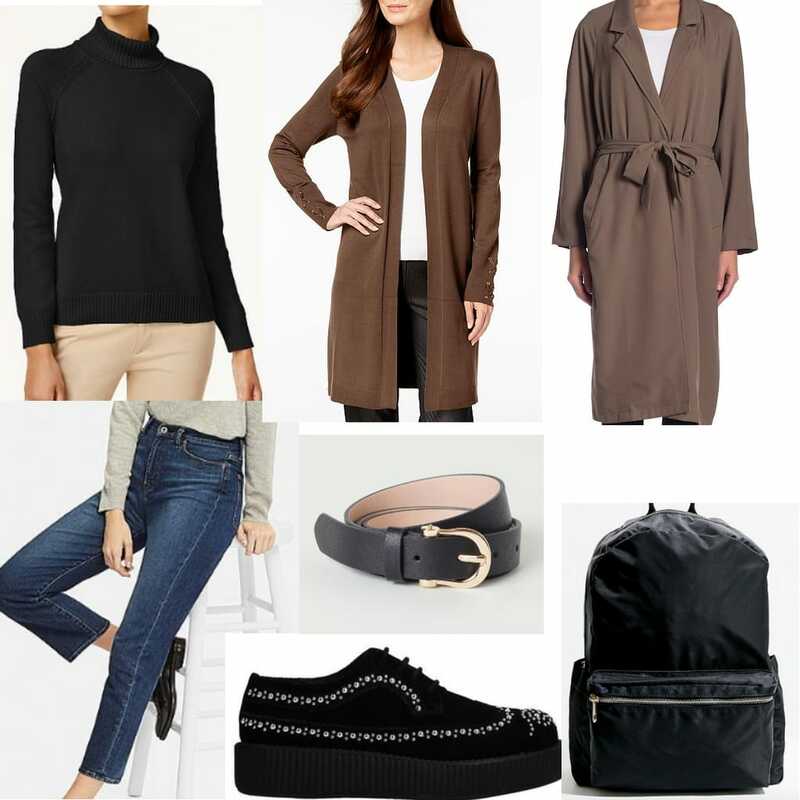 Products: Creepers – Yoox, Turtleneck Shirt – Macy’s, Cardigan – Macy’s, Boyfriend Jeans – Uniqlo, Belt – H&M, Trench Coat – Nordstrom Rack, Backpack – Urban Outfitters. Styling creepers isn’t as hard as you may think. Although they are statement pieces, they’re pretty easy to style. In addition, creeper shoes are very comfortable to wear so they’re ideal for class. They’re easy to walk in and they’re a great casual fashion piece! To get this look, start with boyfriend jeans, the perfect pants to wear with creepers. They give you a stylish look while also making sure you’re comfortable for class. Then add a tight turtleneck shirt to balance out the loose jeans. Turtleneck shirts are totally in and plus, they’ll keep you warm during cold nights. You can tuck your turtleneck into your jeans and then pair it up with a belt to “complete” the look. To add an additional layer, I recommend a cute cardi like this one. Cardigans and turtlenecks are a perfect combination because you’re able to layer up in a way that highlights both pieces without looking too much. This cardigan will bring your entire outfit together and keep you warm! Depending on where you live, you may also need a coat! In New England, temperatures are already dropping to 30 degrees. The best kind of coat to complete this look is a trench style coat. If you live somewhere chilly, opt for wool, or if it’s only somewhat cold, this thinner one from Nordstrom Rack is a great option. Finally, because you are going to class, make sure you have a backpack. A medium sized backpack is perfect for holding all your books and supplies while still looking stylish. 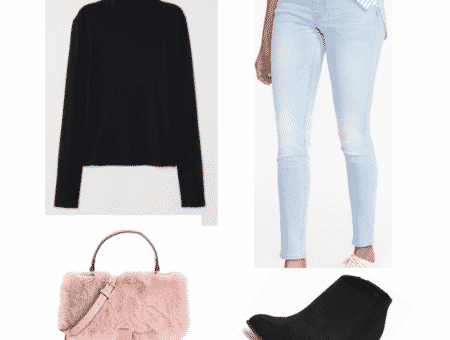 Products: Creepers – Yoox, Circle Skirt – H&M, Tights – Century 21, Thigh High Socks – ASOS, Button Up Blouse – Kohl’s, Cardigan – TJ Maxx, Statement Necklace – Ardene, Purse – TJ Maxx, Peacoat – H&M. 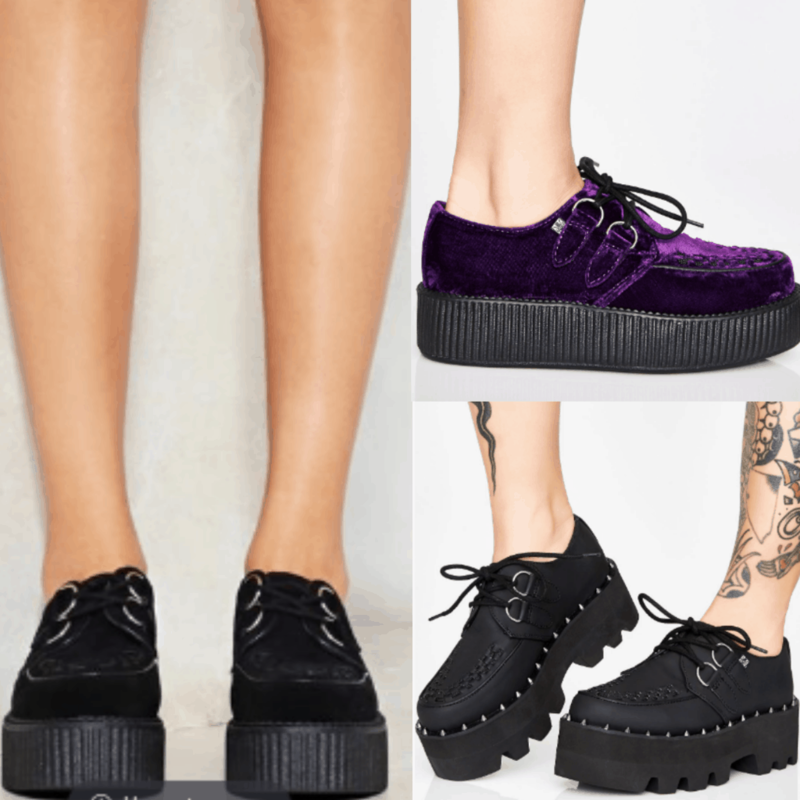 Creepers are perfect for a night out! You can totally wear your creepers for a dinner date or hanging out with friends. To get this look, start by pairing your creepers with a cute circle skirt. 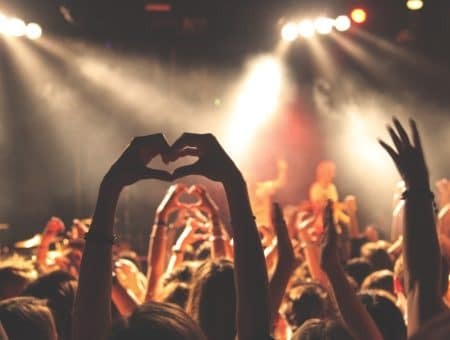 There are plenty of thick circle skirts out there that will ensure that you won’t be cold — and of course, don’t forget to pair your outfit up with tights! Tights will be essential for you if you plan on wearing skirts and dresses in the winter. Then, for another trendy layer, add thigh-high socks over your tights. As for your top, a short-sleeved button up is cute and preppy, the perfect balancing piece for edgy creepers. Because you’ll be out and about, you’ll need a cardigan over top. A short cardigan that’s the length of the short-sleeved button up will make this outfit look perfect because you’ll be able to show-off the circle skirt as well! When you’re indoors, this outfit is totally acceptable and will keep you warm. However, with temperatures dropping, the best coat to go with this outfit is a thick peacoat. Finish the look with a few statement accessories. The collar on your top is a perfect canvas for a statement necklace or even a choker! You can fasten the statement necklace underneath your collar for a cute layered look. Finally, when going out, you need a purse. Wear a black and gold bag that matches your creepers and finally, you are all set and stylish for a night out! How do you guys feel about creepers? Would you wear them? Let us know in the comments below how you would style them!